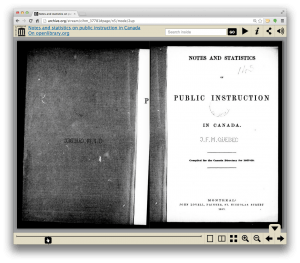 The ActiveHistory.ca blog published a piece in which Ian Milligan of the University of Waterloo discusses the uses of the Internet Archive in historical teaching and research. He has blogged about the Internet Archive before and has talked about how it is the basis of his current major research project. Today’s blog post includes an admirably concise account of what the various options for using the Internet Archive’s massive collection of digitized historical images. Ian mentions that it is his first day of classes today. I wish everyone who is starting their academic year right now good luck. Milligan’s post reminds me of just how good the average standard of teaching in Canadian universities is. In many ways, Canada is blessed among nations.